If this recipe looks familiar to you, it’s because it’s been floating around the internet for a while, but was previously only available on the Primal Kitchen website. Since I know so many of you are currently doing the January Whole30, I figured it was about time I shared this recipe on my blog as well since it’s Whole30 compliant! Sushi is one of my all-time favorite foods. While I do now incorporate a bit of white rice into my diet, it’s not always something I want. Not only that, but the rice-less sushi you find in restaurants is often insanely expensive for really not that much fish. 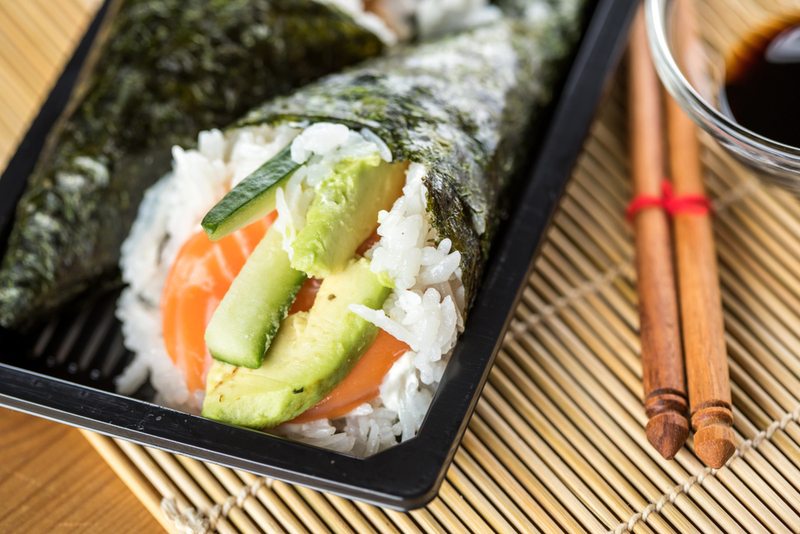 I know raw fish can scare a lot of people, but finding sushi-grade fish is really not all that difficult and can make your sushi night a whole lot easier AND cheaper. Normally, sushi-grade fish is just farmed fish. I know we all like to avoid farmed fish and opt for the wild kind, but for raw dishes, that can be a little risky. Be sure to ask your fish monger (aka the person behind the fish counter) what fish you can eat raw. Chances are, they’ll have something for you! Prep cucumber, ginger, avocado and green onions. Set aside. Dice tuna and place into a medium sized bowl. Add mayo, sriracha and stir until all tuna pieces are evenly coated. Carefully fold a nori sheet both ways until it breaks easily and you have two half, rectangular pieces. Place the half nori sheet in your left hand and carefully add ⅓ of the avocado on top of the nori at a diagonal. 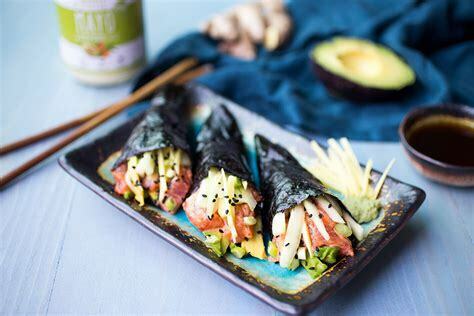 The avocado should hit the bottom left corner of the nori sheet but not the top right, so move it slightly over to the right to make for easy rolling. Once the avocado is placed, add a bit of the tuna. Follow with the cucumber, ginger, green onions. Finally, add the black sesame. Once al ingredients are placed onto the nori sheet, gently roll it so that the bottom left corner becomes the opening and the top right becomes the bottom, tucked end of the roll. To get the nori paper to stick, wet your fingers and rub until it sticks. Continue with the other two rolls until you have 6 hand rolls. Dip into coconut aminos and top with a little wasabi and ginger.